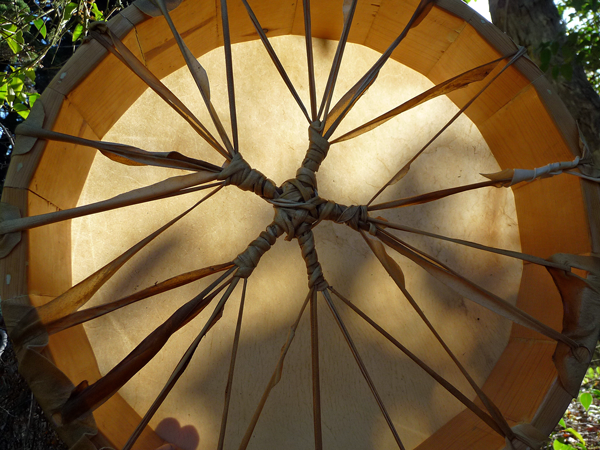 Shamanic Frame Drums | Indigenize! 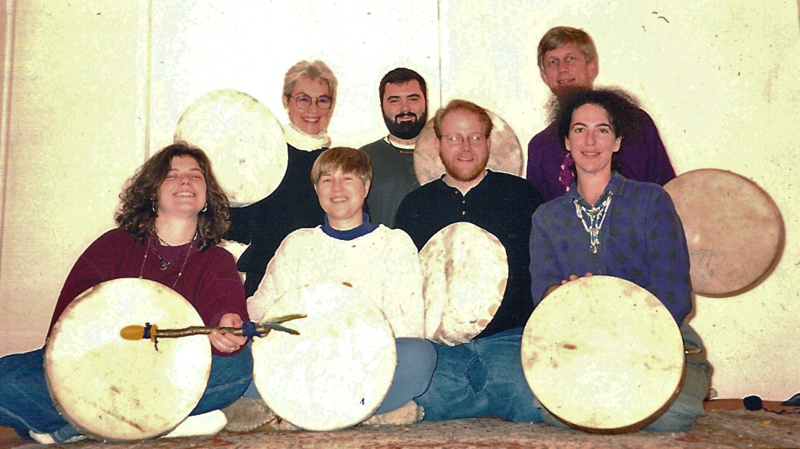 Frame drums are among the most ancient of musical instruments, having been around since ~6000 BCE. They likely originated from the flat pans used for shaking husks off grain. Variations of them can be found all over the world: the North African tar, the Irish bodhran, the Japanese uchiwa daiko, the Dominican Republic’s tambora, the Uzbeki variant on a tambourine. 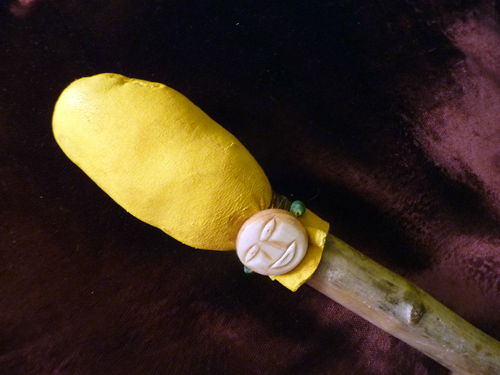 Some are used for accompanying music and dance, and others help medicine people enter the spirit world. 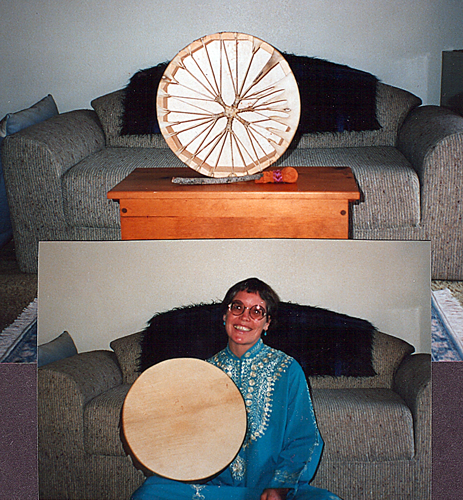 Nearly everywhere they are played, frame drums carry not only music but also strong sacred or ceremonial associations. 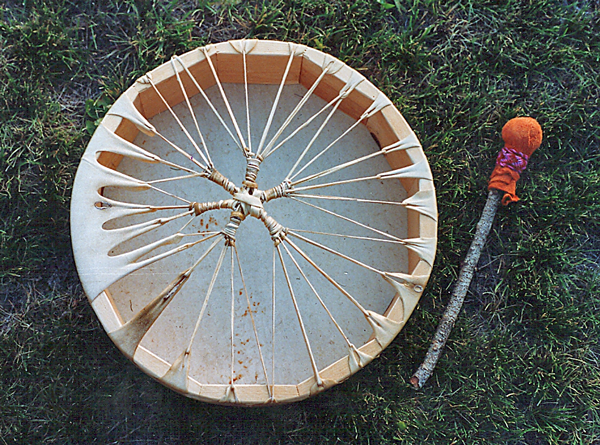 Frame drums with one or two heads are used for shamanic purposes by tribal peoples across Central Asia, Siberia, northern Europe such as Norway and Finland, and parts of North America. When I made my first frame drum back in 1985, I had no idea how to do it. I knew I wanted to work with them, but had no money to buy one and also had the feeling that I should really make it myself. The process of learning how, by doing it, is one of my most spiritually powerful personal stories. I’ve since made many more drums, which are now in the hands of wonderful people all over the planet. 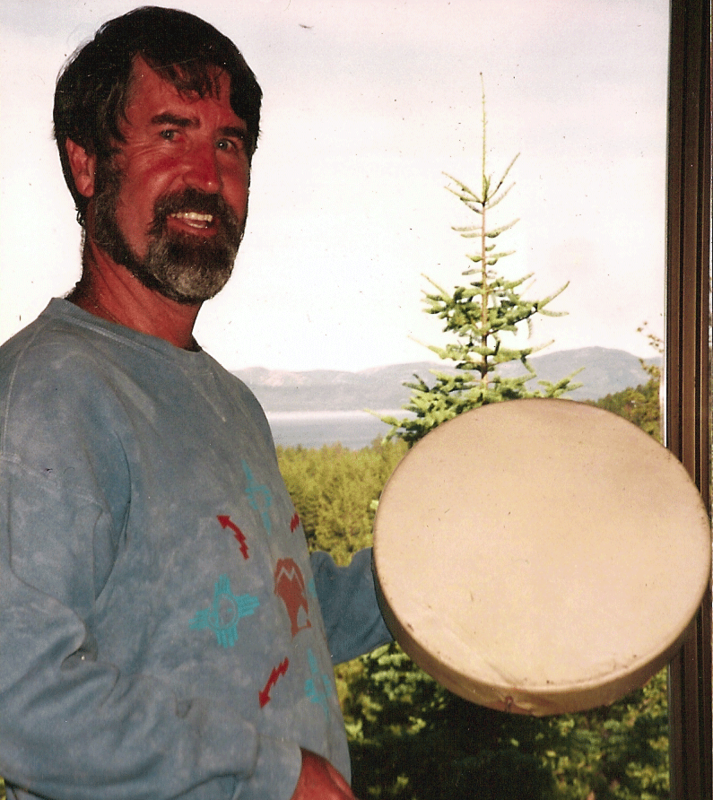 My favorite way to make shamanic drums is to do it upon request and not before, working specifically with the spirits and visions of the person who is to become their partner. Two “Spirit Drums” glowing in the sun. These are made from deerskin and pieced pine boards. You can easily see how this way of tying them forms a star, one that fits beautifully in the hand. I first tried this pieced-wood technique for the frame because I couldn’t succeed at bending thinner wood: in northern Nevada where I was living at the time, the air was just too dry, and they kept snapping. But I’ve since been told that some tribal peoples of the Pacific northwest coast also pieced their drums like this. This Triskell Drum is made of deer and pine, and decorated with henna. What dyes human skin could also dye deer skin, I figured – and it turned out to be true! 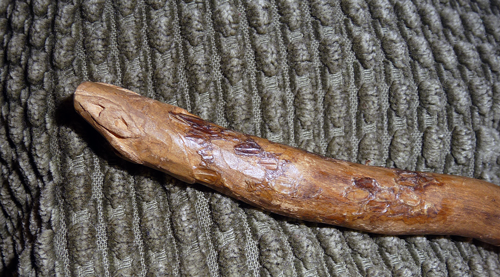 As the dried henna paste cracks off, a lovely, permanent reddish-brown stain remains on the rawhide. 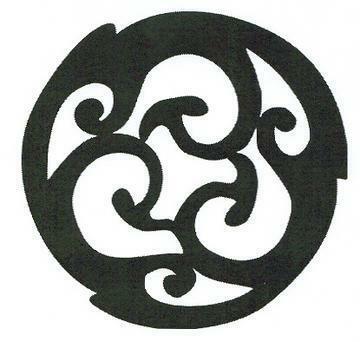 The symbol is a variant on the Triskel, three-pronged spiral beloved in the Celtic land of Brittany; plus some traditional henna flower motifs in the center, clouds from Tibetan Buddhist thankas, and fire around the rim. 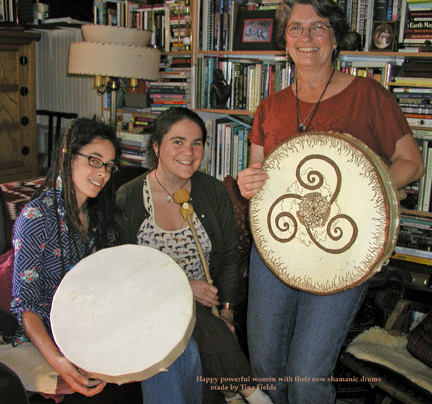 The Triskell Drum is featured on “Drum Journey,” an iPhone app for shamanic journeying! So the old becomes new again, and the spiralling continues. 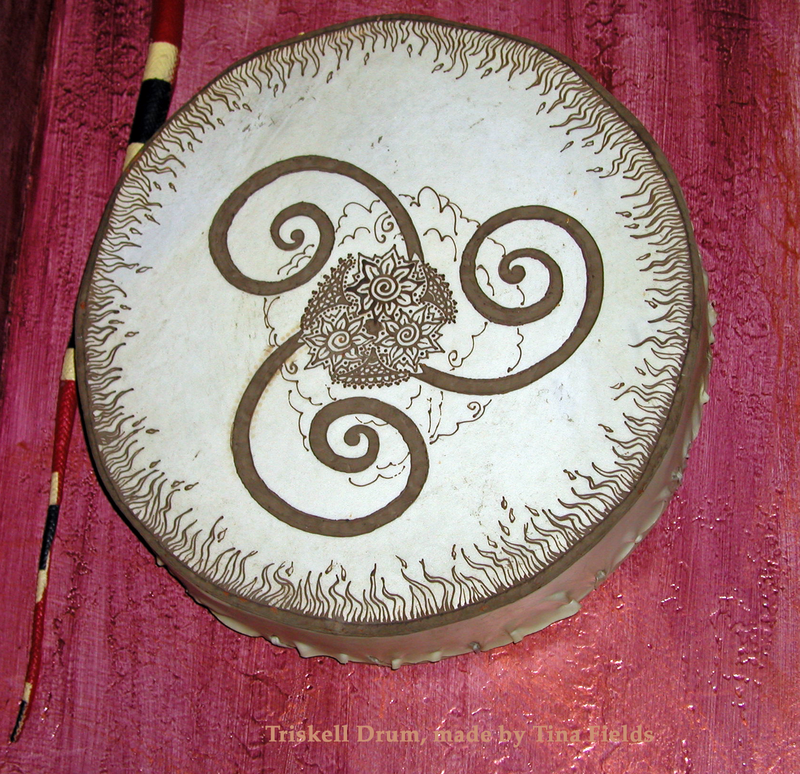 The Snake Mandala Drum is crafted of deer and pine, decorated with henna. 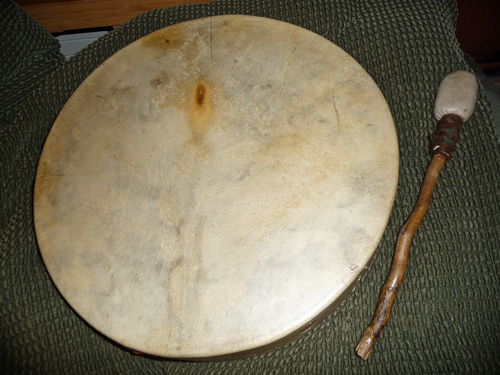 This drum lives with Julianne Skai Arbor. Check out her beautiful artwork at treegirl.org. with rawhide lacing, cut from the leftover scraps of deerhide. I often find myself singing as I tie them. The songs come once only. Each drum is completely unique. Drum case of blue leather with stick, brass goddess clasp, and Celtic zoomorphic knotwork in gilded inks. 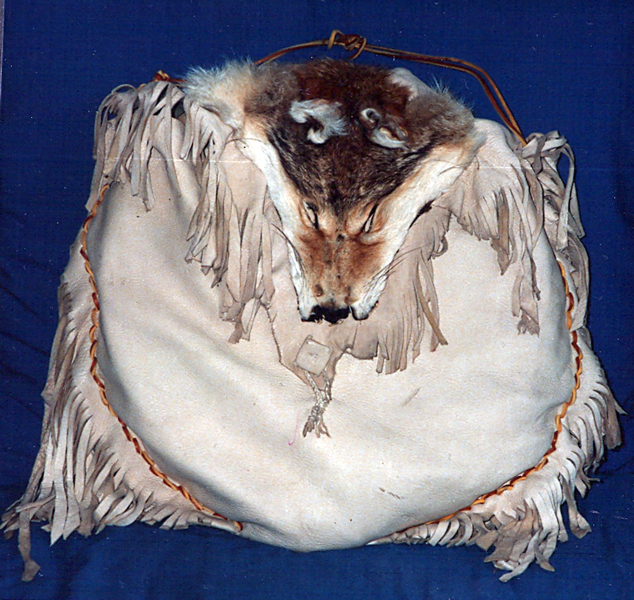 Drum case made of deerskin, embellished with the face of a coyote given to me after found dead on a barbed-wire fence. Its presence here is an attempt to sacralize the coyote’s death. making it yourself with some guidance. 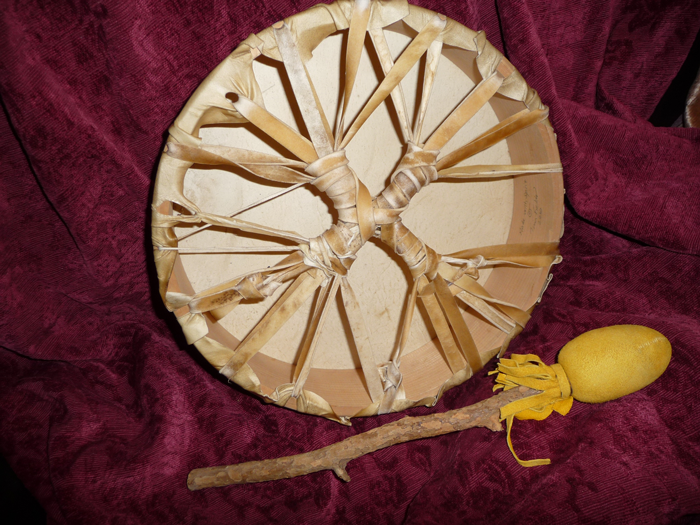 I do ritual for each drum I make, both during the making and afterwards to ‘birth’ it. 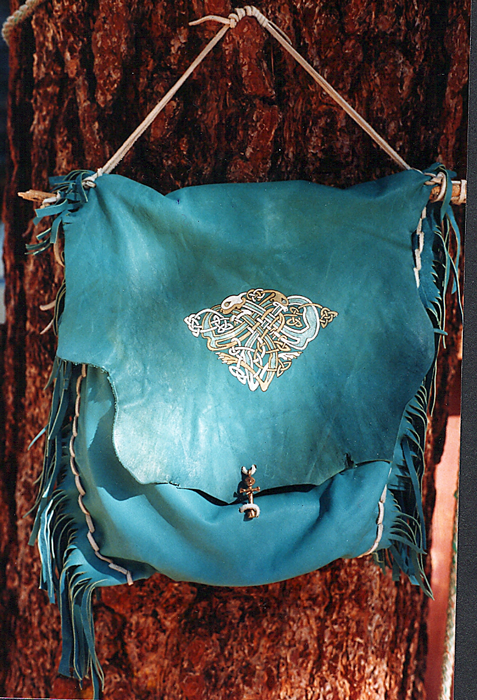 Deerskin over steamed pine, tied with deer and cowhide. This is a lovely and sturdy portable drum with a big sound. Have a Drum Crafted Especially for You! 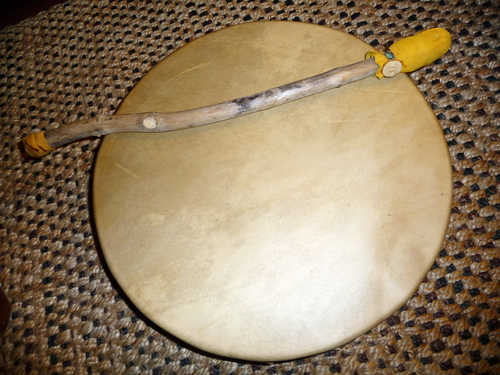 I’ll work with the spirits to craft a drum specifically for you, to serve as a companion on your own unique shamanic path. If you wish to have your drum decorated, I’ll incorporate imagery of particular meaning and power to you into your one-of-a-kind drum and beater. This can be easily arranged for new drums, or to enhance some drums you already own. 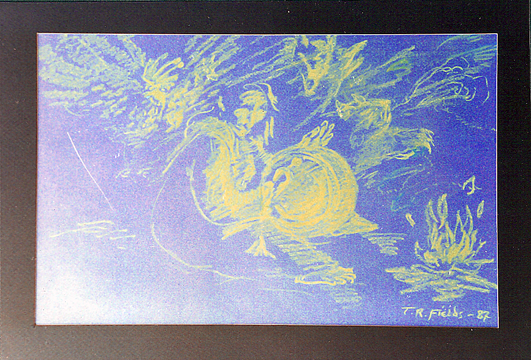 Images can be painted with acrylic paints or permanently stained with henna. Paints allow for many different colors. Henna begins as a thick black paste. When it cracks off, the natural deerskin head is left with a deep reddish-brown stain. Just about any design you desire in monochrome color can be drawn with henna. Motifs: I am experienced at drawing many stylized motifs, including Celtic and Pacific NW Coast tribal designs, Art Nouveau faunal motifs, Southwest tribal geometric patterns, elemental abstracts, animals, plants, suns, moons, spiritual symbols such as “Om,” and more. Embellishment price is $50 and up, depending upon complexity, time and materials. Beaters can be Embellished as Well. Stuffing materials can include your own hair or the hair/fur of a beloved human or animal friend, feathers, cattail down, sheep or alpaca wool, threads from a child’s clothing. Any small soft material you care to send can be included. Decoration: Beaters can be decorated around their necks and/or ends. 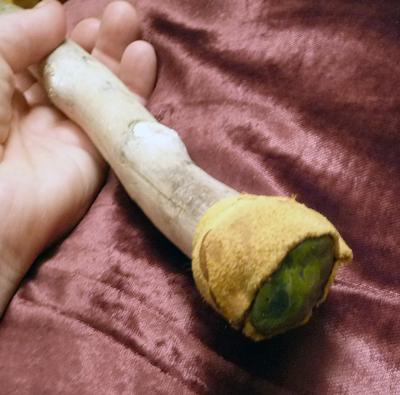 The first beater pictured below, made specially for a client, is sewn of deer hide on a stick from her home area. It is ornamented with two turquoise beads surrounding a larger bead of bone carved with the moon’s face. Its end is grounded with a small serpentine stone, one I found and carried out of the Utah wilderness. When I was making the beater, it seemed like this stone wanted to come along and become part of it. Who am I to argue with a rock? I can be stubborn, but stones can outwait anybody. Plus it’s not a good practice to ignore our elders. The next are pictures of my own drum beater, the first beater I ever made. Its end is carved in the image of a snake face, and it has some real (desert-found) snakeskin glued around its “neck.” I’ve had this drum for 25 years, so the snakeskin has understandably become a bit worn away from use. Perhaps you dream of having an even more personal relationship with your drum. How about Making it Yourself? Drummaking sessions are available for small groups up to ten. If you organize a session of six or more people, you can participate for only the cost of materials. Thanks so much for letting me use your Triskell Drum image in my app, Tina. I’m looking forward to having one of your drums for myself! These drums are wonderful. I’ve been dreaming of a drum of my own for years. Good luck! That’s a beautiful website. The satchel drum totes are worth hanging on your wall whether there’s a drum inside or not. Good stuff! As always, you are impressively talented Tina..
Wow! I want to make a drum….Nicely done Ms. Tina! Wonderful. Did you use cow skin? Can I ask where you got your skin? I have a frame that needs reheading. Also, do you have a lead on goat skins for a Tar type drum? Thank you, folks. Dan, I have a full deerhide here now and am willing to sell 1/2 and/or do the reheading for you. Goat, I’ll check into. If you paint your drums with raw pigment like henna when they are wet and drying the paint is more permanent like a tattoo. Interesting! I’d not tried it wet. The same thing happens when painted dry, though. When the henna paste cracks off, what’s left is a nice red-brown henna stain which is permanent. Most of the pix here show the paste still on; that’s why it looks black. Your process is very interesting; thank you for sharing ! 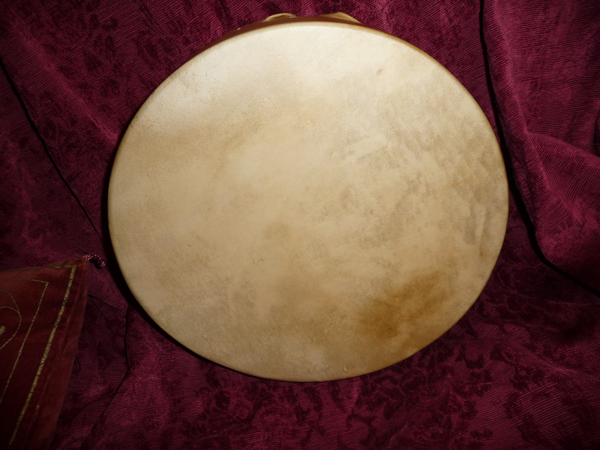 I have bought a plain-faced drum and am ready to imbue it with images through Spirit myself. If I use acrylic, would I have to coat it with anything ? Actually, I like how your henna design looks; maybe I will try to find henna to work with. Hmmmmm.